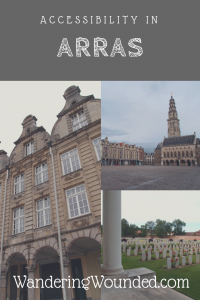 The beautiful mediaeval town of Arras has not one but two gorgeous, Flemish-style central squares. 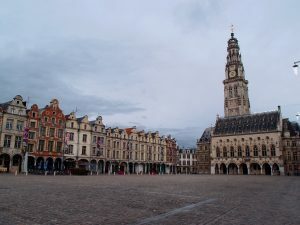 It has the traditional cloth hall and belfry in Place des Heros. If you’re feeling limber and sound of knee, you could always climb the belfry. Since I’m not made of knees, I declined. 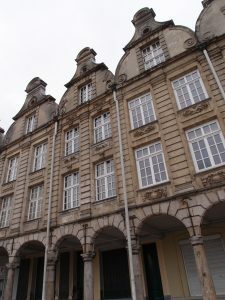 Just around the corner, the Grand’Place is lined with Baroque Flemish townhouses. Many of these were partially destroyed during the Great War but have been painstakingly reconstructed. If you look closely you can see scars of war on some of the facades. In winter, this square hosts the Christmas market, while the rest of the year there are outdoor cafes and restaurants all over this area. Wednesday and Saturday are market days, but unfortunately, we missed those this time. During the rest of the year, the square is used as a large car park, slightly to the detriment of the atmosphere. This is a double-edged sword for accessibility, as it makes viewing the impressive buildings a bit of a hazardous undertaking. 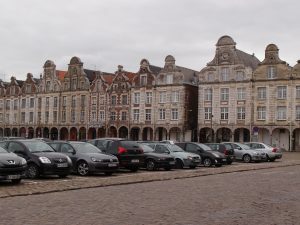 If you can avoid the traffic, it is one of the easier mediaeval squares in Europe to reach, with underground parking year-round. The whole area is very uneven. The two squares are paved with cobbles, though Place des Heros is smoother. The pavements are stone paving and smoother than the squares, although they are most helpful in the area between the squares. Just South of the centre is the very accessible Carriere Wellington, an underground museum below the city. This has level access to the tunnels and excellent information on their website here. I didn’t go on this trip but they are a great example of accessibility. Despite being a series of underground tunnels used during the world wars, they have installed a lift and level walkways. The lighting is low but with level access, audio support, well-informed staff and tours limited to 25 minutes in length they must be one of the more accessible underground tours on the planet. 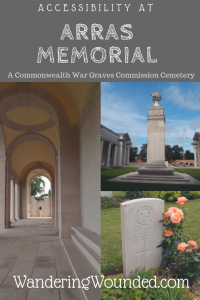 To the West you can find the town cemetery, with a Commonwealth War Graves Commission cemetery. 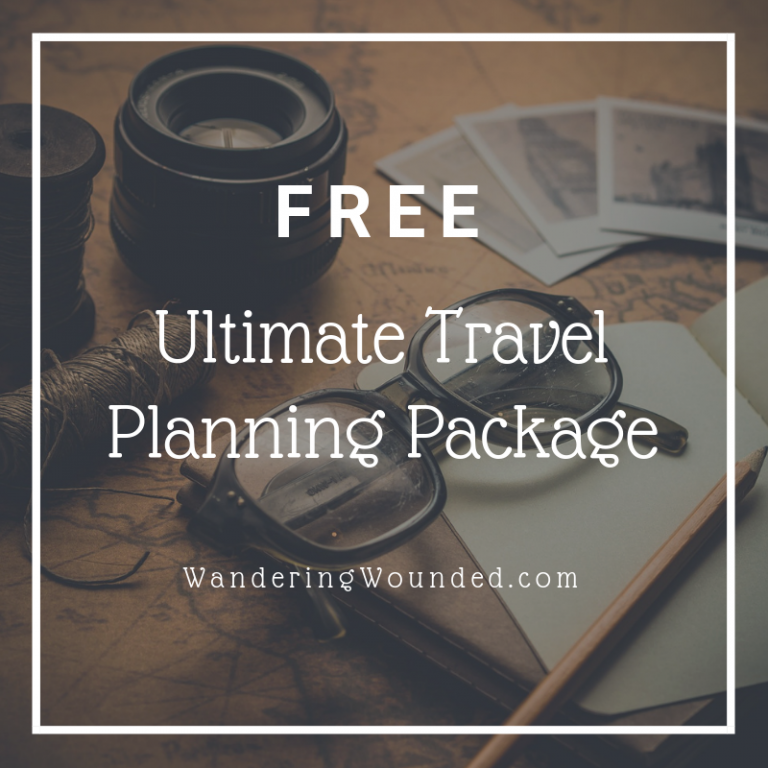 To park, I recommend circumnavigating the site and finding the easiest approach for you, depending on your need for level access and your interests. There’s a citadel nearby if you take a wrong turn! We parked on a quiet street close to a gate, with lowered pavements. 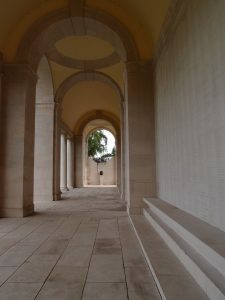 The Faubourg d’Amiens Cemetery rear entrance has level access. 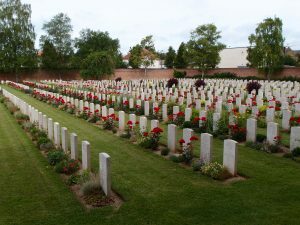 In common with many CWGC cemeteries, the burial areas are entirely grassed. This means that not only the areas immediately in front of the grave markers but all paths between the graves are grassy. As I am ambulant, I found this comfortable underfoot and very level, but it may be harder to wheel. The grass is well-maintained, however, and is close-cropped and firm. 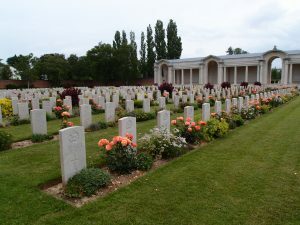 Arras cemetery is dwarfed by the vast cemetery at Tyne Cot, but is one of the larger cemeteries in the area. 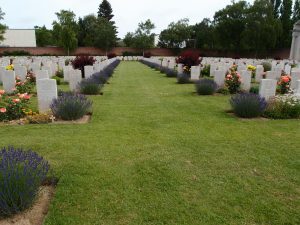 Its graves are in orderly rows and it is a great introduction to the battlefield cemeteries, as it is central to the town and lovingly maintained. This is the grave of Private M Nicholson of the Cameronians (Scottish Rifles), my great-grandfather’s regiment. There are avenues of lavender and daisies, but the main theme here is roses. 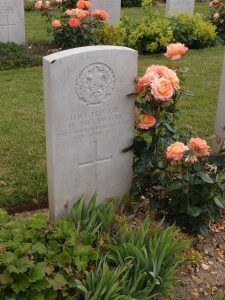 Beautiful red roses mark out many of the rows, and the peach roses that accompany most of the rest of the graves have a strong scent that carries throughout the cemetery. 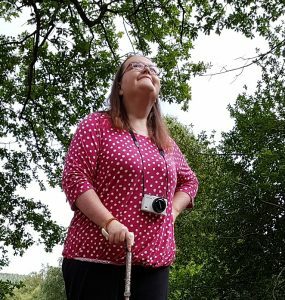 It is a full sensory experience, appropriate to mark a war in which sight loss was a common permanent souvenir of gas attacks. 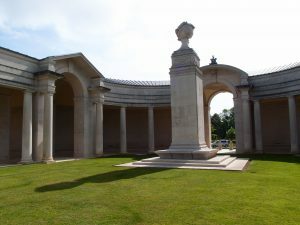 The huge structure that dominates the cemetery is the memorial carrying the names of the missing. There is level access from the main road and from the top of the steps down to the cemetery you can get a good view and smell the roses. There are memorials to the Missing all over the Western Front, but this is one of the largest. The memorial contains the names of 35, 000 killed in this sector between 1916 and 1918. 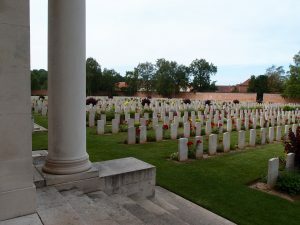 It is one of the most affecting, both in scale and due to the quietness of the cemetery. 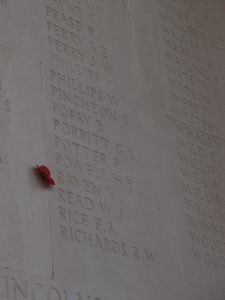 Furthermore, it is possible to have the whole place to yourself to wander the collonaded structure with its wall after wall of names. 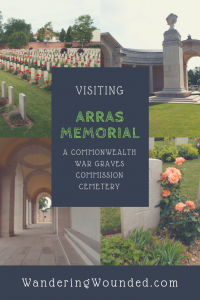 And the fact that the names are those who died in a relatively local area lends an immediacy that helps in understanding the scale of the war. One of the nice things about visiting the larger memorials is seeing who has left tributes. They are collected every so often but kept safe. In the cemetery register, we found laminated cards from an English school. 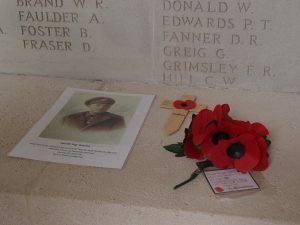 Each had the names and pictures of a lost soldier and the child who researched them. They had written a little about each person and left them on a school trip. Amid the melancholy lists of those who were never found it was a nice reminder that being lost is not the same as being forgotten. Navigating the memorial is straightforward, with places to sit and level, smooth surfaces. The impressive stone column is the Flying Services Memorial, inscribed with the names of almost a thousand killed in the early actions of the air force. The names represent the Royal Naval Air Service, Royal Flying Corps, Australian Flying Corps and Royal Air Force. 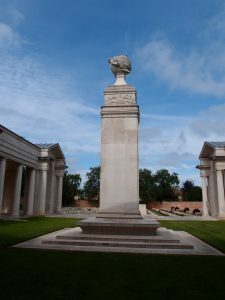 Near the Flying Service memorial column is the customary Stone of Remembrance, designed by Sir Edwin Lutyens. 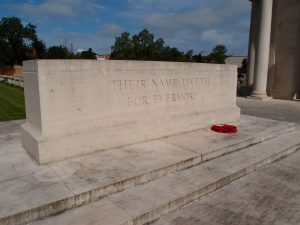 You will find this in many of the cemeteries, a monolith inscribed with “Their name liveth for evermore”. 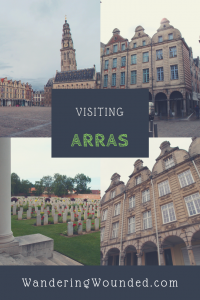 This is part of a series on the Great War sites at the Western Front. 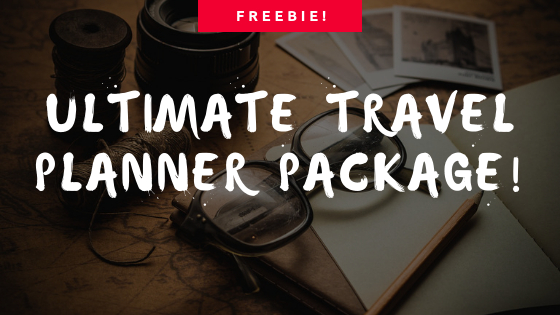 And here are images you can pin so you can find this again!